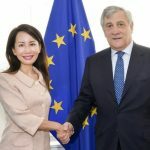 Jane Jie Sun, Chief Executive Officer of Ctrip.com International, Ltd., met with several key EU government officials in Brussels on June 1st. Jane is part of the delegation with Chinese Premier Li Keqiang for the 19th China-EU Business Summit in Belgium. As one of the most famous female CEOs in Asia, Jane hopes her visit to Belgium could further promote tourism between Europe and China. She was named one of Fast Company’s Most Creative People in Business 2017. Moreover, she ranked No. 15 on the Forbes China list of most influential and outstanding business women in the same year. According to Ctrip, China’s largest online travel agency, Europe is one of the top destinations for Chinese travelers, with Chinese travelers making over 5 million trips to Europe in 2016. In 2017, Europe is gaining even more attention from Chinese travelers with bookings to some countries expected to grow by 100% to 1000%. As next year will be the China-EU Tourism Year, Antonio Tajani, President of the European Parliament, voiced hope that tourism would inject more energy to Europe’s economic development. He also said that there is a big potential to promote Chinese trips among the Europeans. Meanwhile, Ctrip remains positive about China’s inbound tourism by deepening its strategic layout in European market. Last year Ctrip acquired UK based world’s leading travel search platform Skyscanner. Currently via its multi-language websites and mobile APP, Ctrip is providing booking services to its customers all over the world, including air tickets of 425 airlines to more than 5,000 cities worldwide. “Ctrip’s mission is to make travel more convenient and bring the world closer together. Beyond that, we also hope to bridge the Eastern and the Western cultures, and promote peace around the world through international travel.” Said Jane at her keynote speech at the internet summit held by the European Parliament. 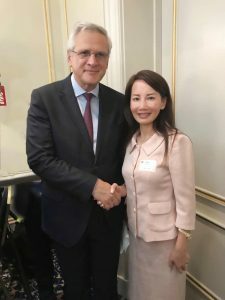 Before the summit, Jane met with Kris Peeters, Belgian Deputy Prime Minister and Minister of Economy and Employment during her visit in Brussels.